Ok That’s Great, so when do partial classes apply to me? Great question! There are a lot of reasons not to use partial classes and for good reason. Partial classes often create bad habits for developers because if used improperly, partial classes will extend a class that most likely should be divided out into another class/object all together. Even if it should be in the same class, breaking it up to gain you a few KB in the file is just silly and causes more headaches when you or another developer goes to it in six months to track a bug down! So now i went through some reasons it is not a good idea and why it is bad practice to use them, so Gregg, why are you bothering to talk about them if I don’t need to use it? Good Question. Think Web Services and Multiple contracts. There are scenarios out there (I just ran into one myself), where you have this master hub service internally that developers use for access third party applications or just other resources within the company through a web service. This web services primary purpose is to limit the amount of developers time being used to rewrite code. Yes I know that is being lazy, but lets face it, we wouldn’t be programmers if we weren’t lazy ;). Now, with that thought, you could very easily have the potential for needing to access multiple DALs and third party applications with this WCF Service. The logical thing would be to create a separate contract for each access layer right? Well, under normal conventions, doing this will require you to create a new WCF Service to along with that contract. In doing this, you have now forced the developer to consume a separate web service as a Service reference. This causes not only bloated auto generated code for each service reference created, but it also requires more maintenance on the developers side by needing to do an Update Reference on every consumed service every time a new feature is added to an one of several services/ contracts. Now, with all that said, maybe that is acceptable to you or you want to give the developers that responsibility. In my case, I wanted very little need for consumption for each access layer and minimal maintenance on the developer. By taking all the contracts and consolidating them into one Service and separating each access layer by contract, you are keeping a separation of concerns, while still providing the developer with a single service endpoint to worry about. To me in the scenario I described, this is ideal and worth the extra effort. Now you may be saying, “Gregg, I know C# can’t do multi-inheritance on classes, only interfaces right?”. Correct, but this is where partial classes do come to save the day. Using partial classes, you will be able to inherit multiple interfaces and by separating the class into partial classes (each partial in a separate file), it will be much cleaner to read. So enough talk, lets code! First Create a new WCF Service Application project. If you haven’t done this before, look up a tutorial on WCF start guides. This guide assumes you have at least created a WCF application before. Once the project has been created, rename the Service file (svc file) to Master.svc. So at this point, you have a web service called Master and it inherits interface IGetData. This interface has a required method of GetSomeData. 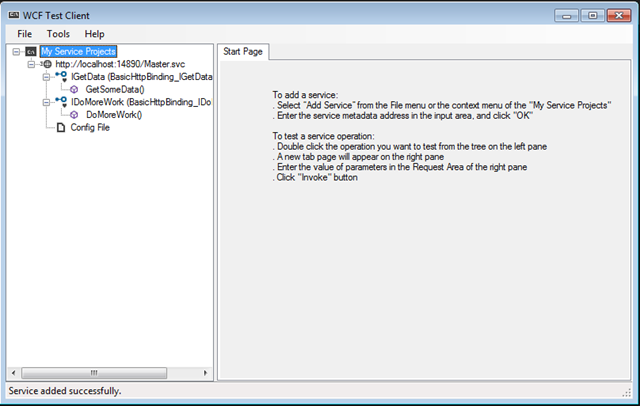 currently, the GetData class is not implementing t his method, so your code will not compile. Lets fix that shall we? ** Note ** Classes do not have to have the same name as the file itself, although for readability under normal circumstances, it should be standard practice. It should also be known that partial classes can in fact share the same file, but in our example we are trying to expand across files for the exact purpose of not overwhelming the developer who reads this later on. Ok so now we have created our first extended class and inherited the interface. Lets do the second one. You will notice that each method is very simple and only returns a string that signifies we are in a particular contract. If you fire up the WCF Test Client, you should see that you consumed one service with multiple contracts, separating your methods into separate contracts for a more logical consumption. The final piece of the puzzle is to add endpoints to the web.config file to tell the service that you really want the service to host both contracts. The only part of the web.config file that actually matters here is the services section. You want to add a new service with the name being the full namespace of the class being hosted. Then inside the service tag, you will define 3 endpoints that define both contracts and the exposure of the meta data for proper consumption. The final step will be to add a base address. This address defines to the service where the base location of the address it will be hosting and listen on. See below for the code and comments. This would be completely legal, but if you think this could get rather large, but still want to keep the same nice flow for developers, the file could get big quick. This is why we went with partial classes for this. This entry was posted in .NET, .NET 4.5, C#, Classes, Contracts, Interfaces, Namespaces, Operation Contract, Partial Classes, WCF and tagged .NET, C#, C#.Programming, contracts, interfaces, partial classes, wcf, web services. Bookmark the permalink.